In the mid-1940s Schweizerische Industrie-Gesellschaft (SIG) began experimenting with a semi-automatic rifles design. Although none of the designs were accepted for service, several hundred SIG SK46s were producing for trials. The SK46 trapped gas from a port near the chamber. The trapped gas then was forced back to operate the bolt, which sat in a cylinder on the right side of the breech. 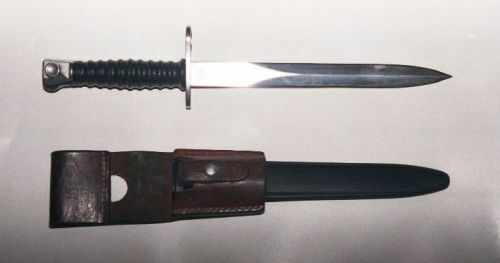 The SK46 showed obvious Schmidt-Rubin influences in stock design, and could mount a Schmidt-Rubin Bayonet. A 2.2x optical scope could also be mounted on the side of the receiver. Over the next several year SIG continued to experiment with a variety of semi-&full-automatic designs. One design the AK53, featured a blow-forward design. When a round was fired, the barrel was pushed forward buy a gas cylinder. On the return stroke, the barrel stripped a new cartridge. More importantly, the AK53 was designed to fire the next cartridge, while the barrel was still on it's return recoil stroke. This, and a slow cyclic rate of 300 rounds per minute made for a very controllable full automatic weapon. However, the AK53 was deemed unsuitable for service and it wasn't until the mid-50s, when SIG came up with a successful design. The AM55, designed under the supervision of Rudolf Amsler, borrowed heavily from from World War II German designs. The AM55 operated using a delayed-blowback system, similar to the one used in the MG42 Machinegun. The AM55 was originally equipped with a wood fore-arm and handguard, as well as metal framed buttstock with wood inserts. Upon successful complete of the Swiss Army's test, the design was altered and a metal barrel jacket and a rubber buttstock were fitted. In addition, the gun was altered to allow the use of Swiss Model 25 Light Machine Gun Magazines. It was in this form that the Stgw.57 was accepted in 1955 for Swiss service. The Stgw.57 had a barrel length of 22.95 inches, with an overall length of 43.5 inches. Empty the rifle weighed 12.25lbs. It was chambered to fire the Swiss GP11 7.5x55 cartridge, and the detachable box magazine held 24 rounds. This cartridge, was loaded with a 174gr full metal jacket bullet, which traveled at 2495fps, when fired from the Stgw.57. The Stgw.57 was a select fire weapon, meaning it was capable of both semi- and full-automatic fire. Cyclic rate of fire was between 475-500 fps. It was equipped with an integral muzzle-break and grenade launcher, and had it's own pattern bayonet. The sights could be folded up for use, or down for carrying, and a bipod could be attached either near the muzzle, or near the breech. The roller-block system is fairly robust, and is not dependent upon a fragile gas system, such as the one that troubled early M-16s and early SIG SG 550s. 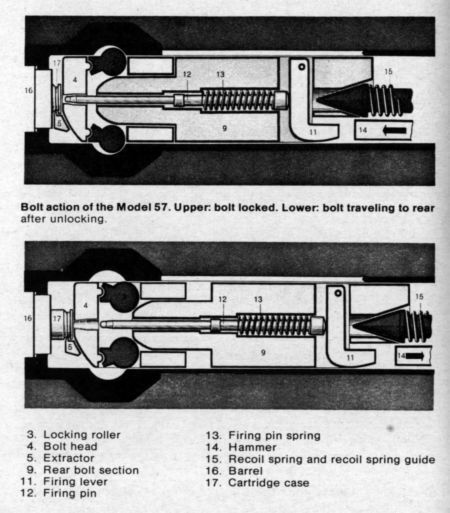 However, firing from a close bolt, can allow for an excess of heat to built up within the chamber, so care must be maintained to prevent "cooking off" the remainder of the rounds in the magazine. Unlike the Schmidt-Rubin Series of Rifles, the Swiss did attempt to export the Stgw.57 to foreign markets. The first model made for foreign sale was the SIG510-1 was simply a Stgw rechambered to fire 7.62 NATO rounds. The SIG 510-2 was a lightened version of the 510 -1. The SIG 510-3 was chambered to fire the Russian 7.62x39 round. It wasn't until the SIG 510-4 that SIG had any success in selling their design. The SIG 510-4 had a 19.9 inch barrel and an overall length of 39.95 inches. The weight was also reduced to 10.5, including bipod and empty magazine. The SIG 510-4 was chambered for 7.62 NATO, and had a cyclic rate of fire was 600 rounds per minute. The folding sights were also replaced with fixed sights. The SIG 510-4 sold well in South America, especially Bolivia and Chile. In addition to trying to attract the attention of the Foreign Military Market, SIG also attempted to attract the interest of civilian shooters. Two major variants were produced. The first, the PE57 is a semi-automatic version of the Stgw.57, chambered in 7.5x55. Nearly 4000 PE57s were produced. The second variant, the SIG AMT (American Match Target) was chambered for 7.62NATO, and around 3000 were imported. Included in that number is a small number number of 510-4s built on full auto receivers, but with semi-automatic internals. At the time, the BATF classified them them as semi-automatic weapons, and today they are likely to bring a premium price. Like their predecessors, the Stgw.57 Series were machined to exacting specification. The Stgw.57 series is generally considered to be the finest select-fire rifle ever made for military serve. Workmanship, accuracy and reliability were unmatched. However, these qualities also made the Stgw.57 the most expensive production rifle of it's time. Today, PE57s and SIG AMTs are quite rare, and consequently, quite expensive. Average price for either is around $3500.00. DSArms is currently selling PE57 and SIG AMT parts kits, and Tennesse Guns sells SIG AMT parts kits. However, in each instance, the receiver is missing. And, there is no known source for domestically made receivers, or U.S parts kits, to allow for the legal construction of the rifle from the kit. 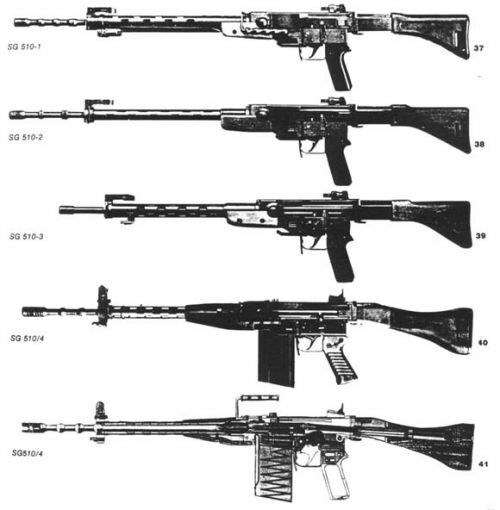 The Stgw57 served with front line units until 1982, when it was replaced by the STG90. However, the Stgw57 is still popular amongst reservists, and continues to hold a place of honor in many Swiss households.